In June 2018, construction began on Canada’s first Joint Support Ship (JSS) for the Royal Canadian Navy (RCN). The JSS contract is part of the non-combat package of the National Shipbuilding Strategy (NSS ), which was awarded to Seaspan Shipyards in 2011, for building four different types of large vessels for the RCN and Canadian Coast Guard. 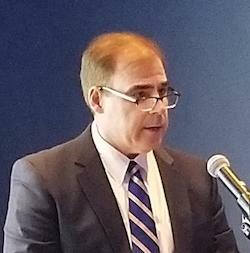 Mark Lamarre, Chief Executive Officer, Seaspan Shipyards making the announcement. Through the JSS project, Seaspan will deliver two ships to the RCN under the Protecteur-class. “Once completed, the JSS will be the largest ships ever built on Canada’s West Coast,” said Mark Lamarre, Chief Executive Officer, Seaspan Shipyards at a news briefing. He explained that these 173-metre length ships will support the RCN’s work at home and abroad for both defence and humanitarian missions. Through its work under the NSS, Seaspan has awarded over $850 million in contracts to about 540 Canadian companies to meet its commitments under this program. As part of its obligations under the JSS project, Seaspan announced yesterday, the award of a $118 million contract to Lockheed Martin Canada to provide the Command Management System for the new JSS. This system is based on Lockheed Martin’s CMS 330, which will integrate the JSS weapons, data, sensors and other equipment into a single operating system. The CMS 330 was designed and developed in collaboration with the RCN and optimized for Canadian Doctrine and Operating Procedures. Gary Fudge, Vice President and General Manager of Lockheed Martin Canada Rotary and Mission Systems speaking about the CMS 330. 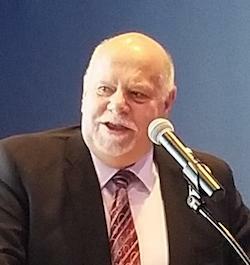 Gary Fudge, Vice President and General Manager of Lockheed Martin Canada Rotary and Mission Systems said that the Canadian-developed CMS 330 is now on five classes of ships across three different navies and can be considered as six classes if the future Canadian Surface Combatant, for which they are the preferred bidder, is included. The CMS 330 performs four key functions: Situational Awareness – the collection of information about the surrounding environment through radars and sensors; Intelligence – converting data into actionable intelligence; Planning – presents the information in an intuitive format so the commander and crew can quickly develop a plan; and Command and Control – directs ship systems to engage and respond to incoming threats. 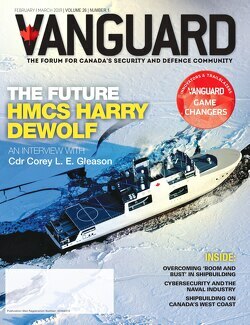 “Whether it is enforcing sovereignty in Canada’s waters, operating in an international threat environment, or engaging in humanitarian or disaster relief, CMS 330 will allow crews to counter threats faster and more efficiently, where and when necessary,” said Fudge. Lockheed Martin will provide the integration for all these systems in the JSS and will design the consoles and configuration of the Operations Room. Fudge explained at a news briefing that their team on the West Coast will work with Seaspan on the installation and during the test and trial phase at sea to ensure the system is operating successfully. 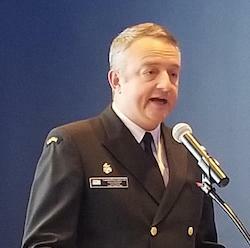 Capt James Salt, Director Naval Major Crown Projects at DND speaking during the news briefing on Feb 6, 2019. This announcement is another significant milestone in the NSS program to equip the RCN with modern vessels to meet its local and international obligations. “The future is bright for Canada’s marine sector and today’s announcement is just the latest example that the NSS is working,” said Lamarre.